Electromagnetic threat real: Could it be a factor in the fall of the USA? « Brexit: Is Theresa May playing ‘Deal or No Deal’? As the photo above shows, the United States Department of Homeland Security sees the possibility of a catastrophic power outage. The principle is that detonating a nuclear weapon high in the atmosphere can generate a massive burst of radio energy that can overload electricity grids, and electric and electronic circuits and burn them out. 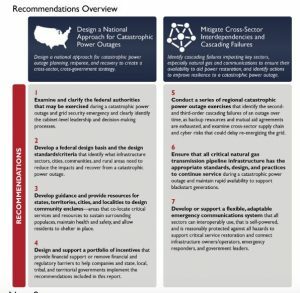 In a new DHS report that warns that the electric grid is the “prime target” of terrorists, Americans are being urged prepare for the up to six months without electricity, transportation, fuel, money and healthcare. You were an intelligence officer with the CIA responsible for analyzing Soviet and Russian nuclear strategy and operational plans including EMP threats. So, let’s begin at the beginning. What’s EMP? You know, all of our computers, our control systems, your cell phones basically operate on that simple switch and there are millions of times more vulnerable to EMP than this crude piece of instrumentation. Big transformers, the size of a house that weighs hundreds of tons. There’s about 2,000 of them in the North American grid, and most people don’t know it but they start the foundation stones of our modern electronic civilization. LEVINE: And when you start to think of electricity, everything we do is associated with electricity, isn’t it? Even if you try and fill up your car, the gas station, the pump, electricity. Everything we do is related to electricity, no? PRY: Absolutely. All the critical infrastructures depend upon it. Communications, transportation, banking and finance. We did an experiment on the Commission and I just — I went to a grocery store and picked up an apple and I wondered how did this apple get on this grocery store in the Washington, DC area? You know, the simple apple? And tracing the history of that apple, it turns out it was grown in an orchard in Washington. It was harvested mechanically, it was cleaned and packaged mechanically using electronic systems and electronic assembly belts. It was put on a refrigerated truck and then drove across the country so that people locally in Washington DC could eat the apple. So, even the simple apple depends upon hundreds of electronic systems in order to deliver it to us. And we wouldn’t have the apple or any other food. In fact, there’s only in a 30-day food supply in the country to feed 320 million people. And water would stop immediately. You know, when you turn on the tap, it requires millions of volts in order to deliver that water through your tap, and the Commission couldn’t figure out how would we keep 320 million people alive, no food, no water, possibly for years? We estimate if we had a blackout in this country that lasted one year and that’s entire possible in these scenarios that we’re talking about, we could lose up to 90% of our population to starvation, disease and societal collapse. LEVINE: Suppose, we wouldn’t be able to function, we won’t be able to get to hospitals. If the USA were hit by an effective EMP (electromagnetic pulse) weapon, this would be more devastating than many believe. An emp incident could be a factor in the troubles that hit prior to the start of the Great Tribulation. Electrical End of the USA ? Could problems with the electrical power grid caused by one or more electro-magnetic pulse bombs, solar flares, and/or other phenomena help weaken the USA to the point of allowing it to be taken over? Does such potential exist? If so, is this consistent with any biblical prophecies? What are some of the severe consequences that the USA would face in the event of a electrical power grid failure? Is there evidence in scripture that the USA will be taken over in the 21st century? Here is a link to our video: Electrical End of the USA? Are you ready spiritually to deal with what can happen in the USA? Even if you do not live in the USA, consider how its devastation could affect you and the country you are currently living in. Electrical End of the USA? Could problems with the electrical power grid caused by one or more electromagnetic pulse bombs, solar flares, and/or other phenomena help weaken the USA to the point of allowing it to be taken over? Does such potential exist? If so, is this consistent with any biblical prophecies? What are some of the severe consequences that the USA would face in the event of a electrical power grid failure? Is there evidence in scripture that the USA will be taken over in the 21st century? Dr. Thiel addresses these issues and more in this video. Is God Calling You? This booklet discusses topics including calling, election, and selection. If God is calling you, how will you respond? Here is a link to a related sermon: Could God be Calling You? Differences Between Islam and the Continuing Church of God What are some of the main differences? Are there any similarities? A video of related interest is titled: Islam: Any Christian Concerns or Similarities? When Will the Great Tribulation Begin? 2019, 2020, or 2021? Can the Great Tribulation begin today? What happens before the Great Tribulation in the “beginning of sorrows”? What happens in the Great Tribulation and the Day of the Lord? Is this the time of the Gentiles? When is the earliest that the Great Tribulation can begin? What is the Day of the Lord? Who are the 144,000? Here is a version of the article in the Spanish language: ¿Puede comenzar la Gran Tribulación en 2018 o 2019? ¿Es el Tiempo de los Gentiles? You can also see the English language sermon videos: The Great Tribulation from the Mount of Olives and Can the Great Tribulation begin before 2020? A shorter and newer video is: Might the Great Tribulation start in 2019? This entry was posted on Tuesday, December 11th, 2018 at 4:00 pm	and is filed under Prophecy. How bad could a power grid failure be?